Welcome to Mini Camping ‘De Oosthoek’. The neat campsite in It Heidenskip ( south west Friesland ) is located directly on through water near the Fluessen and the Heegermeer. 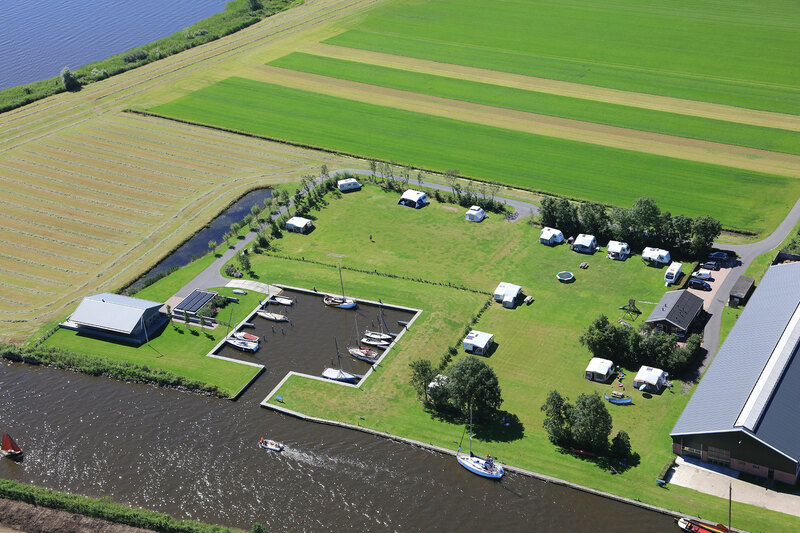 The campsite, which is located on the Inthiemasloot, is situated in the heart of the Frisian lakes aria. The cosy atmosphere and the unique location make this campsite one of the most special in Friesland. Mini Camping ‘De Oosthoek’ is a campsite at a farm in operation ( dairy farm ) and accommodates 25 camping equipment with 16 ampere power supply and a view over the water. The toilet block has 4 showers and 4 toilets and a cosy bad weather accommodation. Here you can use the kitchen, but you can also come for a game or just social gathering. Mini Camping De Oosthoek lies in the heart of the Frisian lakes, in the triangle Sneek, Lemmer en Workum. From almost every spot on the campsite you have a unique view over the water. Sitting on the polder dike is comfortable, while enjoying the beautiful view. After all the Inthiemasloot sometimes seems to be right like a living film, because many boats pass through it. This watery environment is ideal for rod- and water sports enthusiasts. There are also numerous cycling and hiking trails around the lakes and in the beautiful woody Gaasterland. The nearest village is Gaastmeer, which is located on the other side of the Inthiemasloot. A ferry will take you over and within a ten- minute walk you will arrive in this small tourist water sports village. Since 2014 we have our own harbour with trailer ramp. The harbour accommodates 18 boats and is equipped with electricity and water. Due to the unique location, you reach open water in a few minutes. Partly due to the construction of four aquaducts you can go in all directions. For example, you can visit the the many cosy water sports villages or towns, sailing across the beautiful Frisian waters. Camping De Oosthoek is affiliated with the Frisian lakes camping association. These are all unique; they have their own character. They are all very different, what they have in common is small- scale, location on the water and hospitality. The campsites are spread around and directly on the Frisian lakes.